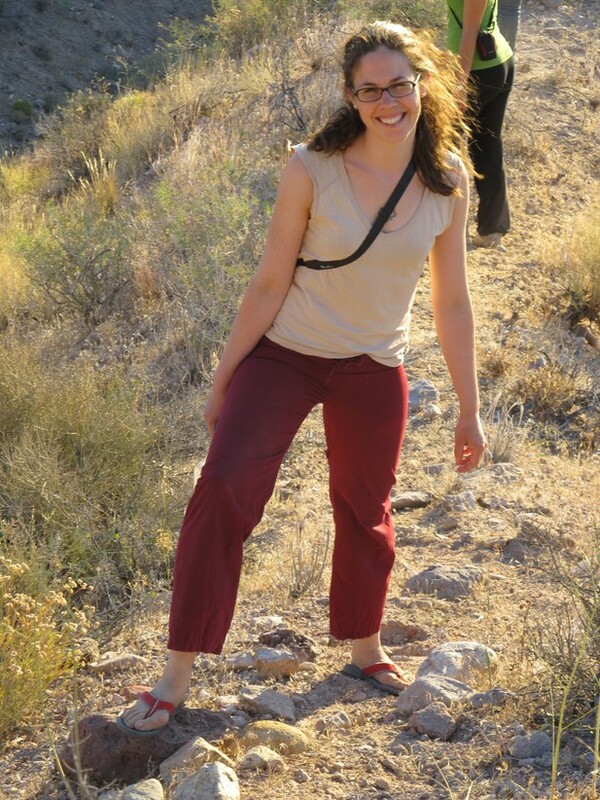 Meredith Schuman was born in Minneapolis, Minnesota, USA, and is currently leading a junior research group at the German Center for Integrative Biodiversity Research (iDiv), where she investigates the ecological roles of genes in populations of the wild tobacco plant Nicotiana attenuata. She hopes to find a tenure-track position in molecular chemical ecology when funding for her current position ends in 2017. Her hobbies include reading, writing, running, hiking, bodyweight training and travel, and she loves teaching. Meredith Schuman. Image credit: Dr. Felipe Yon. My parents are wonderful, intelligent, creative people who value the scientific method. They always encouraged my imagination and curiosity and they were very pleased when I showed a strong interest in science already as a young child. I was obsessed with dinosaurs and loved to play with earthworms, and when I was 12 years old I read the Origin of Species. In my high school biology course we could load and run an agarose gel and watch the DNA move. I was fascinated by the idea of DNA being a blueprint for an organism; I read The Double Helix, The Molecular Vision of Life, and several other books on the origins of molecular biology. I just love science and the scientific method, which is to say I love to find things out. Within the sciences though, I love biology a bit more than the others. What attracted you to studying ecology? I am intrigued by evolutionary processes and the resulting diversity of life, as well as how humans interact with other life and our shared resource: the planet Earth. My work in molecular chemical ecology allows me to contribute to a mechanistic understanding of the ecological big picture. I think this kind of work is very important for helping people to make decisions about how best to both preserve and engineer our environments. Also, I love learning how ecology works and find it inspiring to know how different organisms have developed ways to meet life’s many challenges. Once a plant starts to grow in a particular environment, it is stuck there, so it has an arsenal of chemicals and other characteristics that it uses to “stand its ground”. My research focuses on how plants use this arsenal to both manipulate and respond to their environments. In particular, we want to know the roles that genes play in this process. We investigate this by altering the expression of genes for plants growing alone and in populations, and then compare the altered plants and populations to wild-type ones that are identical except for the genetic change we made. Plants emit a variety of volatile scent compounds as part of their chemical arsenal. These volatiles diffuse from the plant into its community, providing information about the plant’s current status for any other organism that can smell them. For example, plant volatiles might reveal the presence of the plant to herbivores. Damage caused by those herbivores might then alter the fragrance, indicating to predators of the herbivores that this plant is a good place to look for food. We showed that the consequences of emitting a particular fragrance can differ greatly depending on the rest of the plant’s chemical arsenal (Schuman et al., 2015). More surprisingly, we discovered that the volatiles released by plants in populations can affect neighbouring plants, altering herbivore infestation rates, the predation of herbivores, and even neighbours’ mortality! Our results on the importance of neighbour volatile emission imply that plants might gain an advantage from “smelling” their neighbours and adjusting their own “body odour” accordingly. In addition, one role of many plant volatiles is to attract “bodyguards” in the form of the predators and parasitoids of herbivores. This indirect defence strategy can be relevant to agriculture because plant volatiles are generally not toxic, so they provide an attractive alternative to traditional pesticides. Our work indicates that the effectiveness of these volatiles as indirect defences might depend strongly on how they are distributed among plants in an agricultural field. My project group is currently conducting three projects focused on three different genes: a gene for a defence hormone which also inhibits growth; a signalling gene which closes stomata in response to drought but also reduces photosynthetic rates; and a core gene in the circadian clock which also mediates some stress responses. In addition, I am wrapping up a collaborative study on the importance of diurnal patterns for the ecological effects of plant volatiles, and a project on direct effects of neighbour volatiles. My best moment has been in the field: in 2012 I conducted an experiment to determine whether the effectiveness of plant indirect defence depends on the time of day at which plants are attacked. The answer was no, but in a very cool way which I had not expected and hope to publish soon. This was a best moment because I could analyse the data as soon as I collected it… so every 12 hours I would crawl through the dirt for an hour counting herbivore eggs under leaves, then crawl over to a tree and tally up the results. I could barely wait to get my numbers. It was the fastest I’ve ever gone from hypothesis to test to answer. One of the worst “moments” lasted for three months as I was trying to clone two genes that should have taken me two weeks. However from this experience I learned the very important lesson that you can have a protocol that is technically correct but does not work reliably. Now I have the reliable correct protocol and know the difference. Ian Baldwin, who has advised me in several roles and who has consistently supported my scientific career, has strongly influenced my approach to research. Ian believes in Koch’s postulates and gold standards, and in developing an intuition for one’s system based on observations of that system in nature. I am also inspired by Nicole Van Dam, who is now a professor at iDiv. Nicole is a driven researcher with excellent intuition and high standards, and I am fortunate that she has offered me her mentorship. I have observed how she makes herself a positive catalyst in a variety of situations including scientific collaboration, student supervision and administration, and I try to learn from her methods. I hope I will someday understand how she manages to seem so relaxed despite all she does! Who is your favourite historical scientific figure? Like many, if not most, biologists, I am inspired by Charles Darwin. His approach to the world and the clarity of his thinking and experimentation is the best example of biology done right, and fortunately for us, he was also an excellent and a prolific writer. All scientific publications should be open access, and there should be a low-effort forum where peers can publish attempts to replicate others’ results in a way that is explicitly connected to the original studies. This should not reward positive results, and should require the “replicators” to provide their best explanation of why they were, or weren’t, able to replicate the original study. It would be especially helpful if there were an overview following each original study of how many groups had, or had not, been able to replicate the results. Of course there are already many attempts to replicate others’ studies in the body of scientific literature, but not organized in this way, and they tend to be biased toward successful replications. Postdoctoral positions should last longer. I am grateful that I have been able to stay in one environment for several years, allowing me to get to know a system deeply and make meaningful contributions, to gain strategic insight into an institution, and to invest in and develop ideas and skills. These are things that are very challenging or impossible on a 1-2-year time scale, yet so many postdoctoral positions are limited to 2 years or less. This means that one must often start looking for the next position instead of investing fully in the current one. Social justice, environmental sustainability, physical fitness, human and animal psychology, helping and connecting to other people, appreciating the wild nature we still have, learning more about how the world works outside of my area of expertise, reading fantasy and science fiction as different aspects of what we are or might become. I would describe myself as a spiritual atheist. My parents began attending a Unitarian Universalist church when I was a child, a community I greatly appreciate that strongly encourages intellectual curiosity, constructive scepticism, and social and environmental responsibility. I have reached a point where I know that I am always doing as much as I can, as well as I can, to the best of my ability, and that’s all anyone can do. I have learned to set priorities for myself, and although I organize my priorities by topic, I do not rank “personal” and “professional” priorities separately; rather I try to always do what I think is the most important thing at any given time, and to communicate that clearly to others. I found the approach in the book “Getting Things Done” very helpful. I want to be a tenured professor and I want to be involved in programs to develop more sustainable approaches in agriculture. I suppose my undergraduate double major: molecular biology and philosophy. I valued the training in ethics and in logical argumentation I gained from philosophy, but realized that biology and science were my true passions. What is the best joke currently being told in your lab? Our data are way too variable and I’m really bummed out! Let’s go down to the Error Bar and get significantly drunk. Is your partner a scientist? He is a physicist and currently a postdoctoral researcher at the Max Planck Institute for the Chemical Physics of Solids in Dresden. He investigates quantum critical behaviour and other unconventional states of matter that can be observed at very low temperatures (under 1 K). Our first two children were our dissertations. I don’t mean to boast, but he has an excellent publication record. We met 12 years ago when we were both undergraduates studying abroad in the UK. He is German and was studying physics and computer science. We first met during the international student orientation and found each other very interesting. I fell in love with him when he told me he was arrested for blocking a street during a peaceful protest of the Iraq war in Frankfurt, and that he had to appear in court during the first university break (they let him off without a sentence). He fell in love with me when I leaped up and put out a fire started by someone’s cigarette, in a bin on the terrace of a pub, by stomping it out with my boots.